Many investors would welcome a "secret insight" about the stock market that someone whispers in their ear. But you can get "tipped off" on when a financial trend is about to change from a very public source that many investors may overlook. That source is none other than the U.S. government. State institutions generally wait for a strong consensus to become motivated on an issue... Members of Congress, expressing the same extremes in social mood that speculators do, have passed lenient financial legislation near stock market tops and restrictive legislation near bottoms. So, you can get a big clue about a stock market trend change by keeping tabs on major financial legislation. By the time a strong consensus develops, the stock market trend is about over. Near the market top of the 1920s, the government allowed commercial banks to issue securities. But after the end of the severe bear market that followed, a law was passed that separated commercial and investment banking. Indeed, during the decades that followed, government actions continued to lag the stock market's behavior. 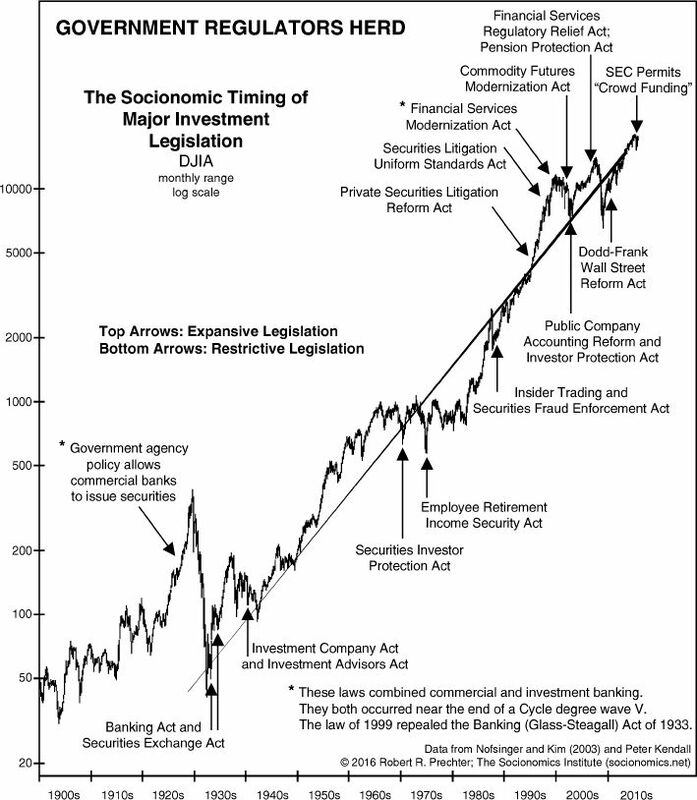 The Insider Trading and Securities Fraud Enforcement Act followed the 1987 crash. Then, after the long 1990s bull market, the Financial Services Modernization Act of 1999 once again combined commericial and investment banking. Just two months later, the stock market topped. In 2010, after the 2007-2009 decline, the Dodd-Frank Wall Street Reform and Consumer Protection Act passed. In a phrase, the law's purpose was to "reign in the reckless Wall Street behavior." Today, it's more like, "what reckless Wall Street behavior?" In other words, the stock market has been climbing higher for nine years. Who needs Dodd-Frank? If passed, the measure would mark the most significant revision of banking rules since Congress passed a sweeping financial regulatory law in response to the 2008 economic crisis. Keeping in mind that the government is the last to embrace a trend, does this mean a bear market is upon us? This article was syndicated by Elliott Wave International and was originally published under the headline Watch This Group Signal Stock Market Trend Changes. EWI is the world's largest market forecasting firm. Its staff of full-time analysts led by Chartered Market Technician Robert Prechter provides 24-hour-a-day market analysis to institutional and private investors around the world.